So it’s been a while 🙂 now we are going to look at our room from the perspective of increasing the isolation and doing the initial mode analysis of our room. From an isolation perspective we can do several things: one – increase the mass of the room boundaries – walls, floors, ceiling and windows and doors; two – seal everything really well – doors, windows, electrical and other boundary penetrations; and three – decouple noise and sound creating elements from the surrounding boundaries to reduce the amount of transfer directly through the structure. And in our example room we really cannot do much else if we’re renting (for example and very commonly asked about) or even if we own it, it might not be within our budget. 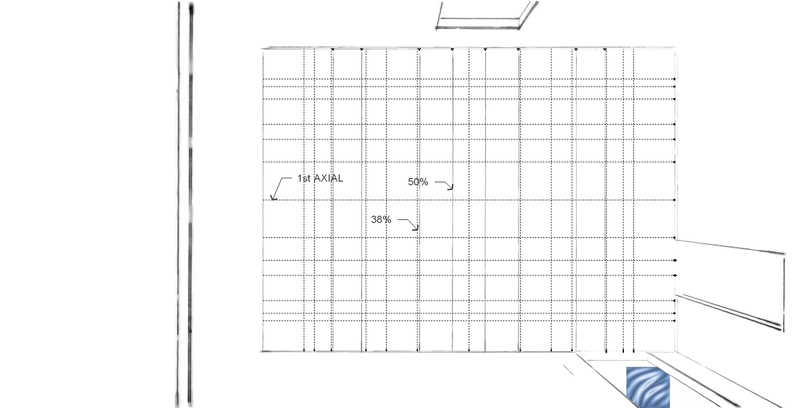 Adding mass to the walls and ceiling is pretty straightforward – we add some more drywall layers. if we choose this, we probably need to strip out the trim and outlets etc so we can add the drywall, and maybe it’s just a single 5/8″ (16mm) layer, and replace the outlets, switches, fixtures, trim etc. if we have access under the floor because it’s joist and subflooring – we can add layers of drywall between the joists (sometimes we line this with “blueboard” foam insulation to even it out because of nails) and seal it all up. Remember – check with a properly licensed structural engineer before adding this extra weight to your building and of course obtain any necessary building permits and inspections needed to correctly complete this work, maintain your certificate of occupancy and your insurance coverage. Increasing the mass on the windows and doors can take several forms but in our example we simply create a window plug to cover the window (like heavy indoor shutters) and seal up the doors. we could add a layer of MDF to the doors to increase their mass, and if they are hollow doors, replace them with solid core doors first. Increasing the weight of the doors means we need to also look at the structure around the door to make sure it is sturdy enough and also we may need to replace the hinges as well. we can make our own stops and seals or buy them from companies like Zero International. Once we finish sealing everything, adding mass where we can, then we need to consider the air flow – in our example room we only have supply vent and no return as it’s a common return for the house. 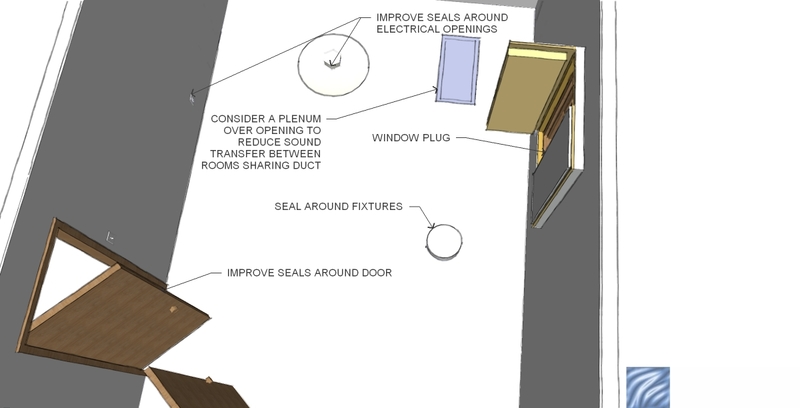 in this case assuming we need some isolation on the ducting, we can build an in-room plenum to isolate the supply from the rest of the house, perhaps big enough to slow the air speed down, and advantageously direct the air flow in the room. for the return, we could build an in room or in hallway plenum which vents into the common space so the return operates as expected. this return plenum could include a fan to ensure positive air flow out to the common area or it could be passive. With isolation design out of the way (and please don’t consider this a trivial step – good isolation like anything else can be difficult to achieve when you have limited options and budget) the next step is to consider what we need to do about acoustic treatment design. the purpose of the design effort here is really to identify your main options for the acoustic treatments and get them incorporated into your budget and planning. what you will do is measure the room response after you complete the isolation work so you K NOW what you’re really into. plus the testing will also help identify any remaining defects in the isolation. From a design perspective, we know that small rooms have a smaller number of modes which have enough space between them to be problematic and the proximity of surfaces causing interference and reflections on our mixing activity which often results in less than ideal translation on other systems. on the other hand we also need to consider the lack of room volume and our need for other considerations in the use of the room – maybe we record acoustic instruments, or someone in the home uses it for painting and bookkeeping. so we want to make some educated guesses as to how the room may respond and also what type of treatments we can add to fit our room requirements and budget. With the room laid out in SU, it’s easy enough to download my mode template (http://sketchup.google.com/3dwarehouse/details?mid=80c3a2c3b34f8cfc6d2f7f4796305f20) and scale it to fit the floor and two of the walls (long and short wall) and see not only the main axial modes but also first choice positions (like the 38% rule) so our subsequent design work can be checked. 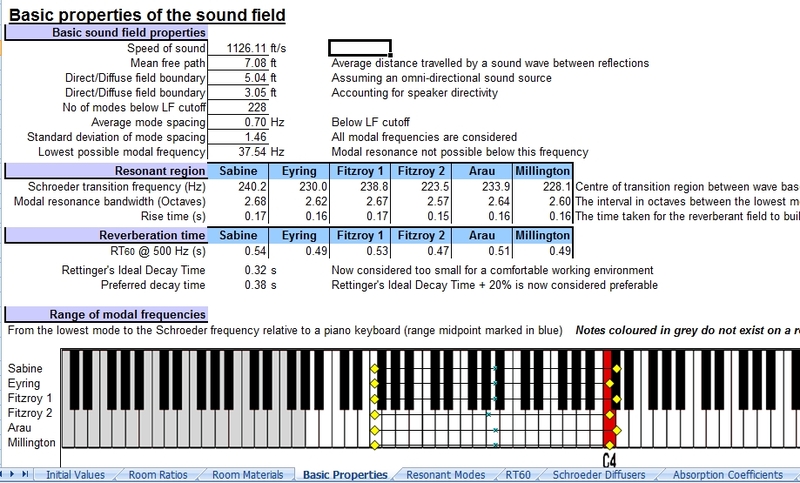 With the main modes identified, we can also use several spreadsheet calculators (or Bob Gold’s online mode calculator) to verify our room characteristics such as tangential and oblique modes, first reflection points, etc. it can help to have some of the key equipment specifications handy when calculating reflections, lowest frequency response from your monitors, possible desk reflections, and speaker positioning etc. Armed with this information, in the next post we’ll start to layout the room based on our assessment. we will start with standalone treatments which are typically commercial products such as those from GIK Acoustics or Real Traps, or they can be DIY treatments (we’ll start with POA (plain old absorbers) and think through more sophisticated units such as VPR or limp membrane absorbers). A subsequent post we’ll look at the use of integrated treatments and understand how they work together to go even further in shaping your room response.